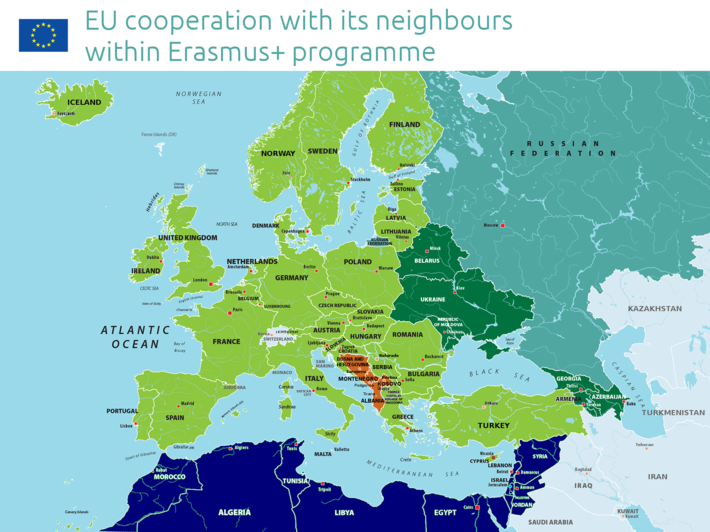 The area of cooperation between Programme and neighbouring partner countries within Erasmus+ spreads over 13 000 km and covers 13 time zones from the Azores to Kamchatka. All together, it includes 55 countries, with a total population of roughly 1 billion people! * Kosovo: this designation is without prejudice to positions on status, and is in line with UNSCR 1244 and the ICJ Opinion on the Kosovo declaration of independence. * Palestine: this designation shall not be construed as recognition of a State of Palestine and is without prejudice to the individual positions of the Member States on this issue.